A 2002 study stated that about 88,000 kids under the age of 18 in the U.S. used a wheelchair. For these children, their chairs are an essential mode of transport, but this doesn’t mean that the devices have to look boring. These days, there are a plethora of colorful and creative options out there that transform wheelchairs into fun as well as functional objects. However, in this article we’ll explore a selection of even more awesome alternatives that might help younger (and older) chair users inject yet more fun into their wheels. These ten custom-built wheelchairs allow their owners to express their individuality – and they may make the devices more desirable to children. X-Men founder and comic book hero Professor Charles Xavier, a.k.a. Professor X, is arguably one of the world’s most famous, albeit fictional, wheelchair users. However, the design of the custom chair pictured was clearly also inspired by another geeky subgenre. 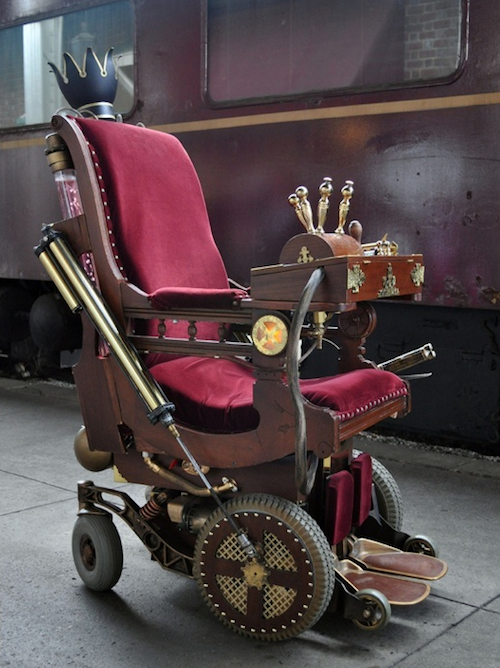 This incredibly detailed recreation of the erstwhile professor’s wheelchair draws its inspiration from steampunk. It was designed by Daniel Valdez of Smeeon Fabrications and is constructed out of a late-19th-century Eastlake platform rocker that was reupholstered with red fabric and fitted with pistons. It is completely drivable and includes an LED panel to inform the user when it’s time for a recharge. The vehicle also features an MP3 player-compatible sound system with a mini subwoofer, while compartments in the back of the chair can hold drinks. Perhaps far more period appropriate, though, is the steam-emitting pipe, which is perfect for making a dramatic entrance. Wheelchair users can often struggle with difficult and uneven terrain that able-bodied people simply take in their stride. 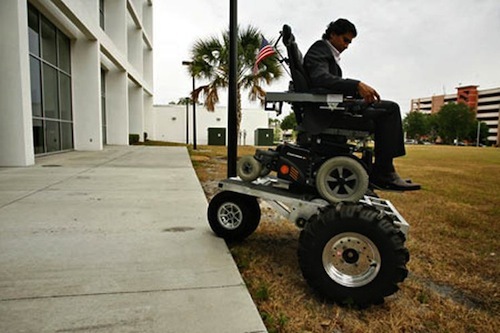 Startup company Rehab Ideas sought to address this in 2008, when it developed the No Boundaries Off Road Wheelchair Kit. CEO Stephen Sundarrao set up the company at a research facility at the University of Southern Florida, where he works as an engineering instructor. Rehab Ideas aims to make life easier for disabled people through creative innovations and has already patented and licensed a handful of student inventions. These designs include a $110 foldable crutch that can be carried on to planes and the No Boundaries Off Road Wheelchair Kit, which allows wheelchair users to traverse more difficult ground. The latter design incorporates a 150-pound platform into which standard wheelchairs can fit, ensuring a safe and secure journey in spite of the conditions of the path being negotiated. 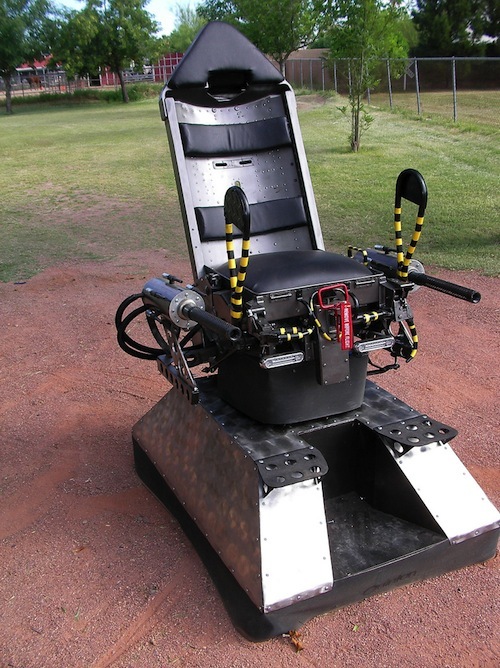 The Action Trackchair is a modified wheelchair with a formidable look. Not only does this all-terrain vehicle (ATV)-like device feature two 6.5-inch-wide and 90-inch-long military-style tracks, but it also includes optional extras like gun racks and mounts and comes in a choice of colors. For some reason, we’re drawn to the camouflage style. This “go-anywhere” chair doesn’t skimp on comfort, either, as its tilting, 23-inch-high seat should make it as pleasant to sit in as more traditional models. Plus, it has all the usual wheelchair controls, which make it easy to use, too. The only thing it lacks is zip, as the 24-volt DC motor can only get it up to a top speed of 5 mph, with its maximum range 8 miles. 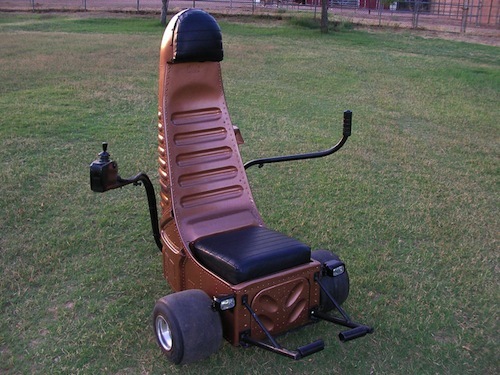 The Action Trackchair retails from $9,000. 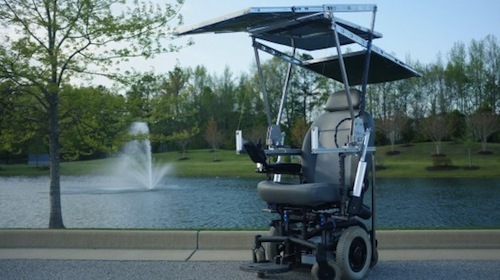 Sustainable energy is all the rage these days – and with good reason – so a solar-powered wheelchair makes sense. The sprawling canopy may make the chair look ungainly, but its custom-built, 11-square-foot solar panel allows it to motor along at 1 mph for an indefinite period of time – and with no need for another power source. Users wanting to enjoy a faster speed will be pleased to learn that the chair can also travel at 5 mph for 4.5 hours. Its design earned a group of students from the University of Virginia the top prize in the 2013 Change My Life in One Minute competition, which was planned to coincide with World Cerebral Palsy Day. The team received $20,000, which they intend to spend on further improvements to the chair. At the moment, though, it includes handy USB ports for charging other electronic devices, while that solar panel also offers welcome shade for the user. Lance Greathouse established his company Greathouse Labs specifically to create awesome gadgets – not least one-of-a-kind wheelchairs. The B-52 Ejector Seat is perhaps the most James Bond-like of designer Greathouse’s range of rugged wheelchairs, and it may make you think twice before you sit down. The B-52 Ejector Seat Wheelchair features an authentic B-52 seat that was actually propelled from a plane on duty. Phoenix, Arizona native Greathouse purchased the seat from a market for $150, and it has made a startling addition to his life’s work of helping people with disabilities, as inspired by a younger brother who suffered from Parkinson’s disease. Greathouse’s hardy designs – which he donates – are intended to help users pursue their hobbies and dreams, no matter how outdoorsy or energetic. If the ejector seat just isn’t cool enough in your eyes, though, take note: the side guns also blast fire. 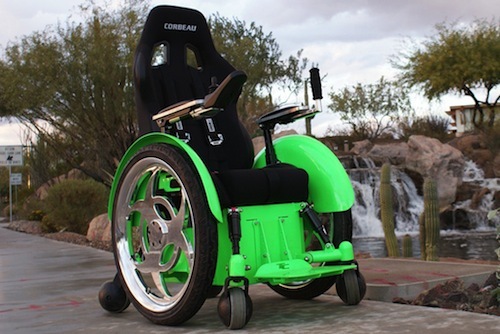 TC Mobility’s Speedster is a much more streamlined model than its Tankchair predecessor. The Speedster offers users speed and agility, with its 24-volt motor helping it reach up to 2,400 RPM. The striking color scheme on its aluminum body and the eye-catching chrome wheels also give it a sophisticated look and help it stand out from the crowd. The Phoenix, Arizona-based firm isn’t resting on its laurels, either, as there’s currently a new version of the Speedster being researched and designed which, according to TC Mobility, aims to “provide even more impressive performance and style” upon completion. This interesting Lance Greathouse creation is a three-wheeled chair that incorporates the seat from an F-4 fighter jet. “Most wheelchairs look too medical,” explained Greathouse to Wired. “If you want something done, you pretty much have to do it yourself.” His custom-made motorized wheelchairs are designed to match the personalities of each individual user. In fact, after making his brother a cool customized chair, Greathouse noticed that people starting treating him differently. Rather than feeling sorry for him, people started saying, “Oh, that’s awesome. Where did you get that?” This chair may not promise the speeds of the vehicle from which it claimed its seat, but it’s a distinctive and elegant creation that should win the admiration of all who see it. This customization brings physics to the forefront. Incredibly, the rocket-powered wheelchair pictured can zoom along at speeds exceeding 60 mph – according to its British creator, Briton Giuseppe Cannella, at least. What began as a gimmick soon got serious, as Cannella added a jet engine to the back of an old wheelchair owned by his mother-in-law, who has Parkinson’s disease. Canella, who loves model planes, used his knowhow to create the prototype, which was unsophisticated but effective. As he explained to the BBC, “It is just the wheelchair with the engine bolted on the back and steering on the front.” In 2004 the chair stole the show at a model plane championship in Lincolnshire, England, where Canella demonstrated his innovation. And best of all, it was all for a good cause, as the invention helped him raise money for the Parkinson’s Disease Society. 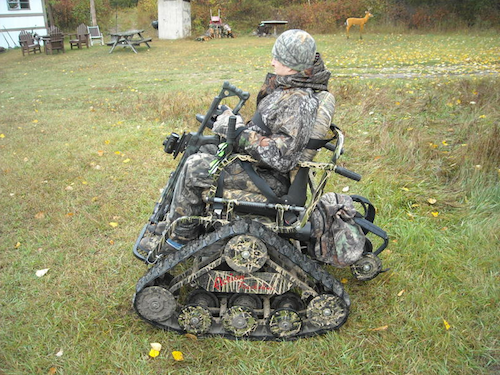 This has got to be the most intimidating customized wheelchair we’ve ever seen. Once again, it’s the brainchild of Lance Greathouse, who first came up with the idea after visiting the studio where the U.K. version of Robot Wars was filmed. After chatting to the show’s special effects team, he was inspired to create the Lord Humongous chair. Lord Humongous took Greathouse a month to assemble, and he spent about $1,000 in the process. 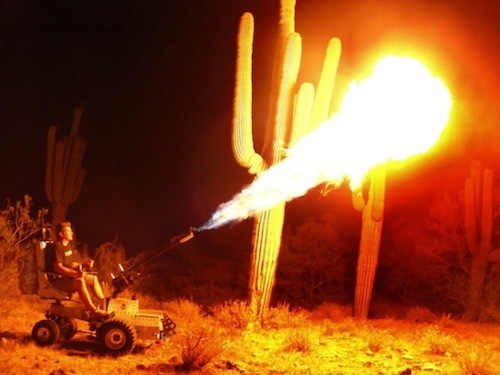 It includes a helicopter seat, rugged tires and repurposed dentists’ gadgets – as well as those super-cool flamethrowers. The result is a mobile, durable and powerful machine that shoots fire a distance of over 35 feet – and we’re not sure we’d want to get on the wrong side of anyone using it. 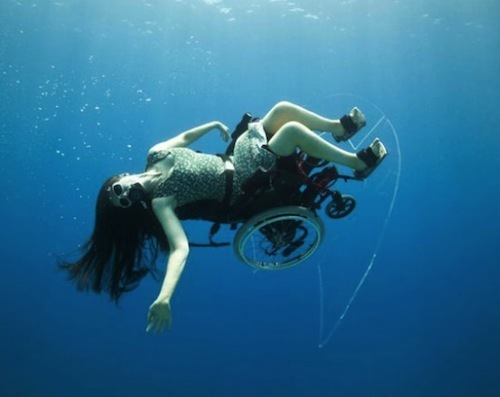 In 2012 U.K. artist Susan Austin not only modified her wheelchair; she took it from land to water. Austin has used a wheelchair since 1996, and it seems as if she wanted to stretch her sea legs. To do this, she fitted dive thrusters, flotation devices and control surfaces to her standard National Health Service wheelchair, enabling her to navigate it underwater. The submersible chair is part of her Freewheeling project, which aims to explore art and disability. 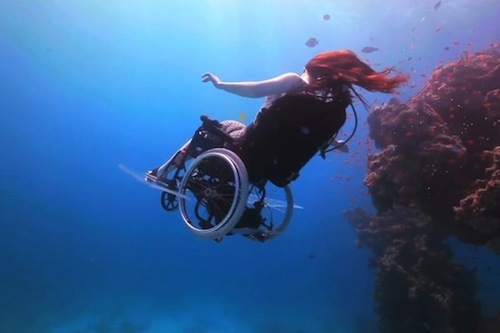 Austin filmed a dream-like performance art video of her using the chair in its new watery habitat, and with the success of the 2012 London Paralympics, the timing of Austin’s artistic innovation was perfect. She has now filed a patent for the wheelchair design and is hoping to launch a version of the chair that anyone can buy. So watch this space: wheelchair-using children could soon be getting much more enjoyment from trips to the swimming pool and the beach. This entry was posted in University Rankings on November 1, 2013 by tjentz.